Now you can upgrade to the Battery Powered Inspector Monitor. It has incredible digital clarity you’ll love! Steve reports that the Advanced FFF Class will offer an amazing and unique learning opportunity for all who attend. This class will be a gathering of some of the smartest HVC technicians from across America and Canada seeded in with regular mix of professional service technicians. All students will be trained by a Master Certificated Furnace Safety Instructor® with an all new training agenda. This assembly of the smartest HVAC technicians for an open forum learning experience is something that has never been done in the HVAC industry before. This forum will present the incredible opportunity for an exchange of ideas that would never be possible by any of these techs thinking learning independently of each other. Certainly there have been occasions that many HVAC service technicians have been in one place before, but it has always been for a convention or other type of industry trade exposition. Such a group has never been assembled and allowed an open forum to exchange ideas and expertise in training class before. If you consider the endless possibilities of this opportunity for a learning exchange, your investment in the Advanced FFF training would be something that would pay dividends for many years to come. Hi, I’m Steve Moon of Moon Services HVAC in Elkton, MD. In my 40 plus years as an HVAC contractor I’ve had only a few phenomenal mentors. There were Jim Abrams, John Young, Terry Nicholson, and Tom O’Connor. The first three were industry training and marketing leaders, and Tom O’Conner is an inventor, author, and technical training master. I’ll call these my own choice for the big four influences in my career. The only one of these mentors who remains in the HVAC business to this day is Tom O’Connor and to be honest, he is my life-line to business success. A huge lesson that I learned from these mentors was to focus on the residential service and sales side of HVAC and to let the new construction part of HVAC go to my competitors (God bless them, somebody has to do the commercial business)! New Construction work is highly competitive, and the competition is fierce and cut-throat. Commercial HVAC has quite low margins, and business opportunities rise and fall with the economy. Large developers look for the lowest cost, and worker benefits are not very good. And hopefully you’ve never got caught in the trap of a failed local contractor defaulting on monies he owes you. One the other hand, the residential service/replacement business is the area of greatest opportunity. Business is a awarded by home owners based on a contractor’s reputation, expertise, experience, service and relationships. Margins are hight, you get paid faster, and lower bidder doesn’t always get the contract. Union wages are not as much of an issue. This is the way to succeed in residential contracting. I decided early on that I would put my time and serious efforts into building my HVAC company into the dominant market share leader it is today. 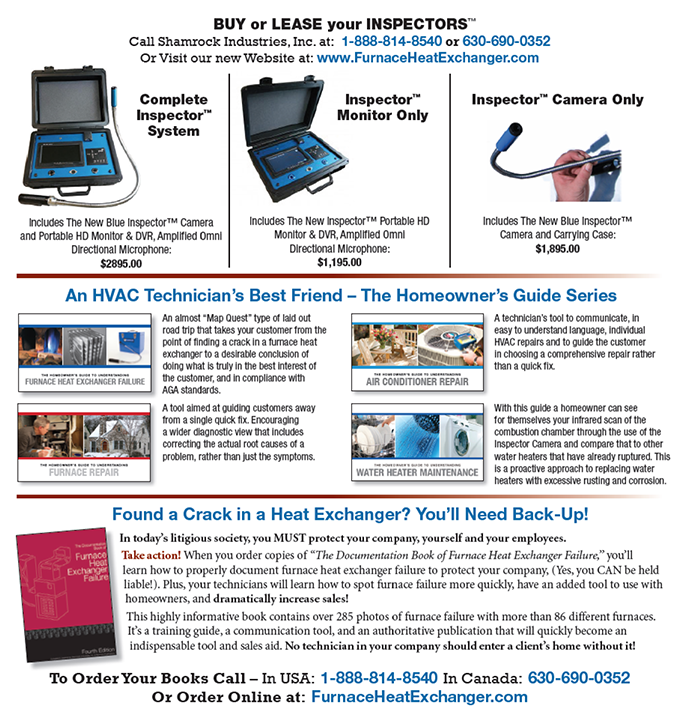 To all my friends in the HVAC business, I whole-heartedly endorse the Inspector™ camera, because with it I have become not only the largest and most successful contractor in my hometown, but also the SEXIEST MAN ALIVE!!! Who’d have guessed… right? I’ve also never found a better training class than Shamrock Industries’ Focus on Finding Failure and for this 2014 fall season, Tom is rolling out his all-new Advanced Focus on Finding Failure class. I truly am excited about Tom;s new class. Many )or even most) of us have made a lot of money from what we’ve learned in one of Tom’s classes. I’ve even tried to learn from Tom by offering to take him to dinner sometime when he has no class! Well, Tom has reached out to me and a few fellow contractors and with our feedback has developed (or re-developed) his original Focus on Finding Failure class. When Tom asked if I would like to co-host this year’s class, I told him I would be truly honored to do it. What I’d like to do is announce to you what the new Advanced Focus on Finding Failure class has become and why I know you really won’t want to miss the extended opportunity it presents for HVAC techs and owners. Basically the original Focus on Finding Failure class that we’ve attended in the past (I’ve attended with my technicians four separate times over the years). So here is the coolest part of the Advanced FFF new format. There will be multiple forum-group-training rooms. Each training room will be taught by one of our master trainers (Tom, Todd, Denis, Dan, and Chris). The training that you’ll experience in each room will be something that has never happened before in our industry, and you’ll be in on the maiden voyage into HVAC history and discovery. Yes, there will be heat exchanger inspector training using the New Blue Inspector™ camera and the new battery-powered HD digital monitor, but there will also be some previously unheard of bonus classes. One such class will be one conducted by one of the top-performing HVAC selling techs I’ve ever known, and this class too will be taught in an open forum. So in addition to all the great technical things you’ll learn, there are classes that will allow you and your people to return home with a remarkable boost in your tech sales skills. This training will exemplify new and innovative ways the Inspector™ camera and all the new features, such as Macro Imaging and DVD creation, will allow technicians to properly and productively use the Inspector™ to its fullest potential. The training will include hands-on demonstration utilizing dozens of furnaces, evaporator coils, and IAQ inspections within an actual training environment. Tuition for this two-day class & work lab is $895. Satisfaction Guaranteed. You can get further information or call to register at: 1-888-814-8540 or 1-630-690-0352.